Shabtai Gourmet Gluten Free Bakery is Kosher for Passover! Also dairy and casein free, peanut free, soy free, and corn free...available online and at many markets. Gluten-Free Yidels Devils Food Mini Chocolate Swiss Roll Wins Best new Passover Product at Kosherfest New Product Competition 2010. Shabtai Gourmet is a dedicated gluten free, dairy free, peanut free, soy free, lactose free, casein free, corn free, and kosher bakery. Shabtai ships his gluten-free sweets across the United States & Puerto Rico. Woodmere, NY, October 19, 2010 --(PR.com)-- Shabtai Gourmet Gluten Free Bakery has just won the Kosherfest Best New Passover Product Competition for the 4th time. This time the winning item was their Gluten-Free Yidels Mini Swiss Chocolate Rolls. The judges couldn't stop raving about this new item when they first saw and tasted it - one judge said he devoured the sweet in 1 bite. The super mini roll concept was developed by Shabtai while making sampler packs for the kosher, organic, and natural food trade shows. This new item from Shabtai Gourmet Gluten Free Bakery is not only gluten free, but also Dairy Free, Peanut Free, Lactose Free, Soy Free, Corn Free, Certified Kosher & is also Certified Kosher for Passover. Retailers are dedicating more shelf space for Gluten Free Foods and allergen free foods sections in their stores. In fact dedicated Gluten Free Food Stores are popping up all over the country, and only carry gluten free products. In past Years Shabtai Gourmet has won best new product with some of their other items, such as their Gluten Free Devils Food Ring Ting Cupcakes, Gluten Free Bell Ring Cakes, & their unforgettable Marzipan Sushi. Thanks so much for letting us know about the prize-winning Shabtai bakery, Andrew. The samples you sent me were delicious! A little sweet for me, but my tasters loved them, and we were all happy that your products are dairy and casein free as well. 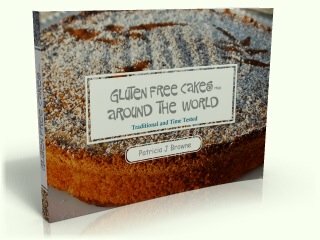 The concept of baked goods appropriate for Passover fits perfectly with the theme of Gluten-Free-Around-The-World.com. I am very happy to recommend Shabtai gluten free bakery for anyone with a sweet tooth. Some items are super sweet, while some are medium sweet, but all items have regular sugar. Note: I notice that on the website the mini chocolate rolls are now called gluten free devil's stix. I like that they are casein free and corn free, too.